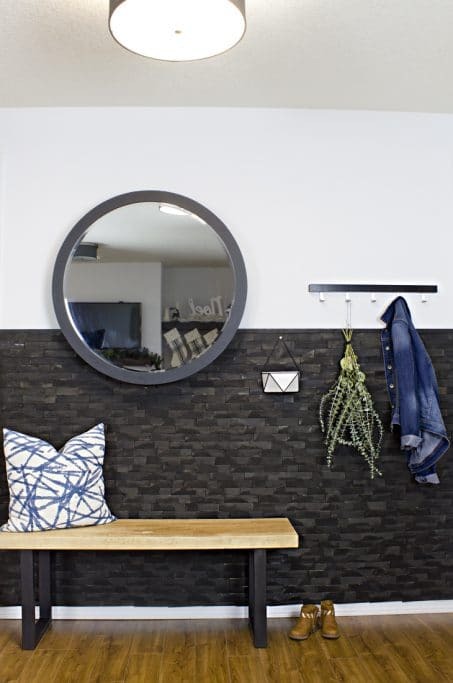 This industrial modern entry includes a mix of DIY projects with a custom wood slab bench and wood shim wall along with simple, modern decor. 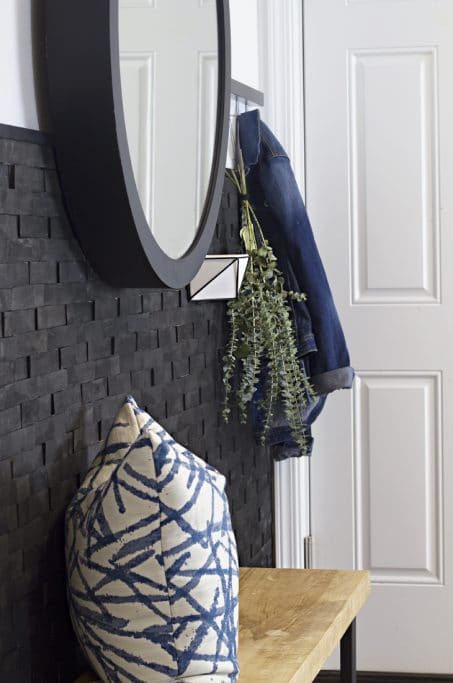 Check it out for all the details on this entryway. When you walk into your home, what is the first thing you are greeted by? Does it scream to your guests how you want them to feel in your home? Warm, inviting, edgy, modern? Do you have the party home ready to host guests until the wee hours of the morning or maybe a cozy atmosphere where you hope people want to sip a cup of tea in front of the fire? Let’s just say our entry was not saying what I wanted it to say. Instead of inviting, modern, and put together, it screamed boring, dull, and dated. Don’t search the archives, but I actually posted about our entry makeover years ago and it’s so embarrassing to admit that it stayed that way for 4 years. What was I even thinking? So, all that to say…an entry makeover was long overdue! I’m so excited to show you our new industrial modern entry! When you open our front door, you immediately are in the living room, however, to the right is a blank wall and is the typical spot that we dump our keys, mail, shoes, and anything miscellaneous. It was a never-ending dumping pile and I’d get the entry table cleared and 24 hours later it would be a mess again. The first item on the agenda? 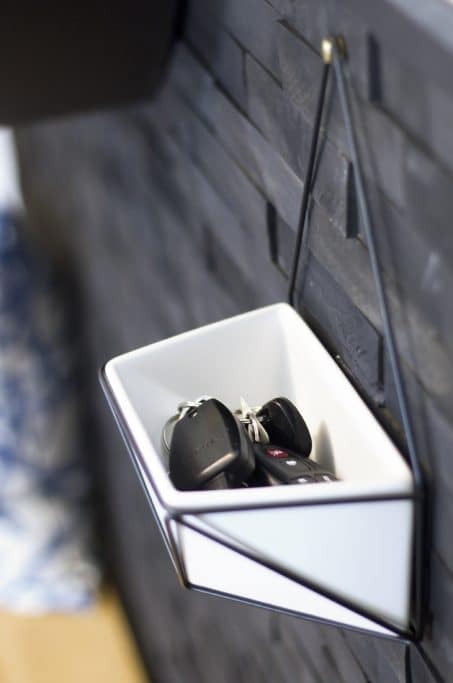 Ditch the entry table! We decided to tackle the entry and our navy powder room at the same time trying to get them both done before the holidays. Related: Making over your home? Get inspired by these gorgeous modern living rooms! Let’s start with that wall! I was totally inspired by Bre from Brepurposed laundry room reveal. I love the wood accent wall she did and wanted to take the elements I loved from her space and morph it to fit our space and style. 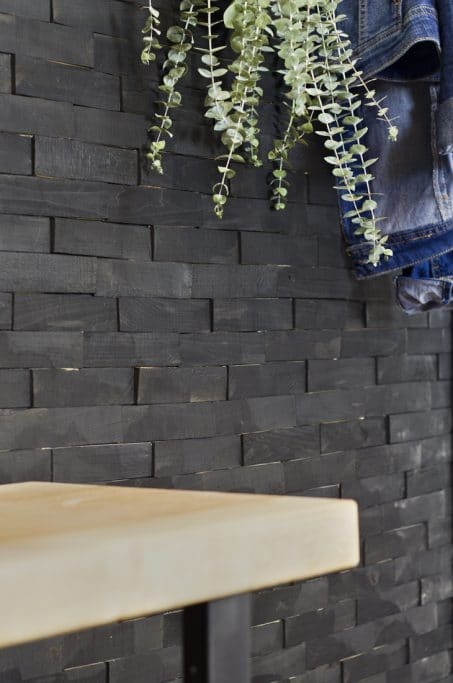 I’m going to do an entire post on how we made the wall, but let’s just say 538 wood shims, lots of sanding, and many hours later we have a stunning feature wall. 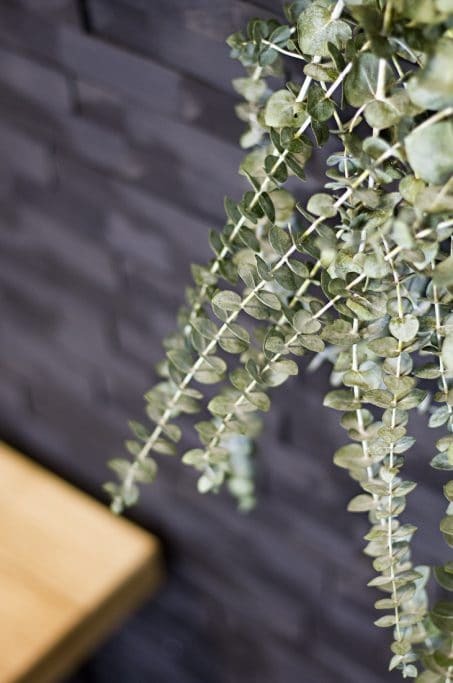 I’m a major fan of feature walls and I love being able to add a fun design or texture, rather than just throwing a different paint color on the wall. 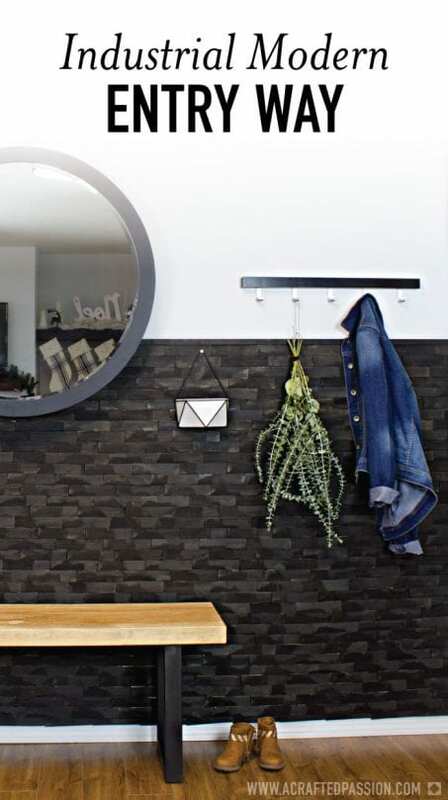 Check out these feature walls without paint for more inspiration! I really wanted a wow backdrop for our entry, but didn’t want it to be too overpowering since the space isn’t too large. 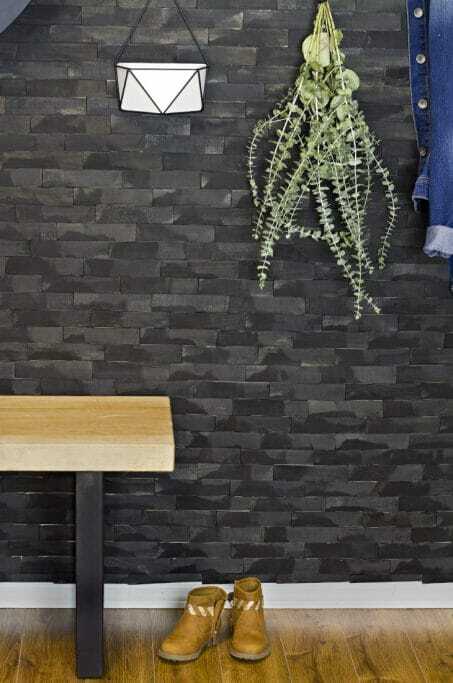 This wood shim wall turned out amazing and I love the texture it adds to the space. This wood slab industrial bench is a simple DIY project that turned out perfect! With little ones, we often sit on the stairs putting on shoes so I thought a bench would be a perfect piece of furniture to ground the space and be functional. Tutorial coming soon on how to make your own industrial bench! As I’m working my way through simplifying every room in our home I realize the need to have a place for everything. I started by looking at what was getting put on the table and worked to find homes for those things like the mail, keys, receipts, books, loose change, dog leash, and old gift cards. Besides the keys, everything else found new homes in different areas of the home. Remember the pile of shoes I mentioned earlier? Well, I got this shoe cabinet from IKEA and installed it right outside the door to the right of the entry in our garage. 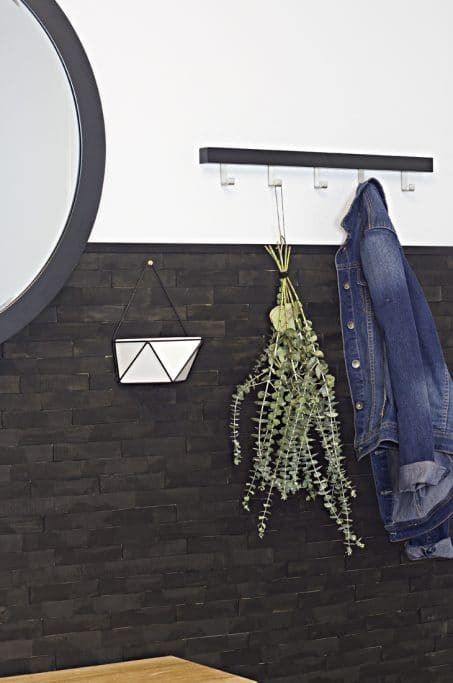 I found this cute hanging geometric planter at Target, spray painted the hanger matte black, and now we have a perfect home for our keys to be stored. The dark gray semi-flush ceiling light is from AllModern and simply gorgeous! So much better than our dated, antique bronze light that was there before. I just actually purchased another light from AllModern for the rest of our main lights on our main floor. 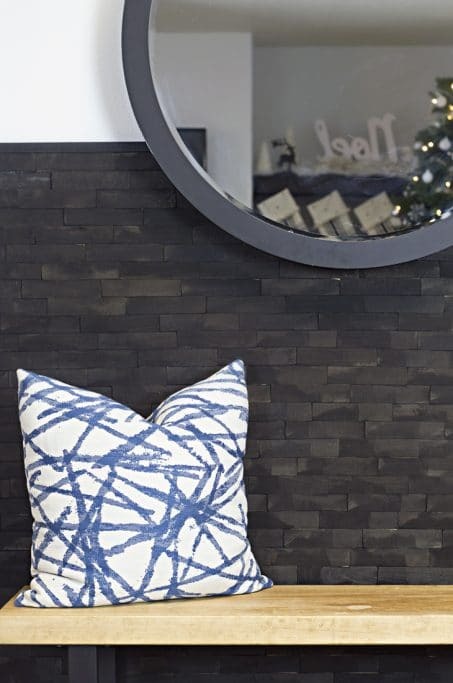 This brushstrokes pillow is a Target find and I like that it adds a graphic aspect to the entry. You can get the pillow here. I searched long and hard for a large, round mirror that was reasonably priced. It took some perusing online and in stores, but I finally found this dream of a mirror at HomeGoods for $40. What?! Mirrors this size are usually a couple hundred dollars. There’s a small knick in the mirror, but no one would ever notice if I didn’t tell you. Of course, we needed a spot for coats. Living in the Pacific Northwest, we get rain A LOT. Raincoats are a necessity. Yes, we have a coat closet under the stairs, but we rarely use it on the day-to-day basis and coats typically just get strewn on the nearest chair in the living room. Rather than try to change our habit by hanging it up in the coat closet (because honestly that’s not going to happen for many reasons), I figured I’d make it simple by adding a coat hook. I grabbed this simple coat hook from IKEA. It’s the Tjusig and less than $10. I love that when you walk in our home now you get a sense for who we are. I like to pretend we have our life together and the entry will hopefully make a good first impression for people entering our home for the first time. We’ve got a little family-friendly, a little modern, and a lot of awesome going on now. I love it and it was totally worth the hours upon hours of work gluing up those shims. What do you think are the necessities in a well-functioning entry? Let me know in the comments below if you think I’m missing anything! Looks amazing!!! I love it!